Hello everyone! Did you have a nice weekend? I had a very low key weekend surrounded my friends, family, and of course, my doggie Chowder. But we're back to the working world now, and I'm ready to start the week off with a bang! 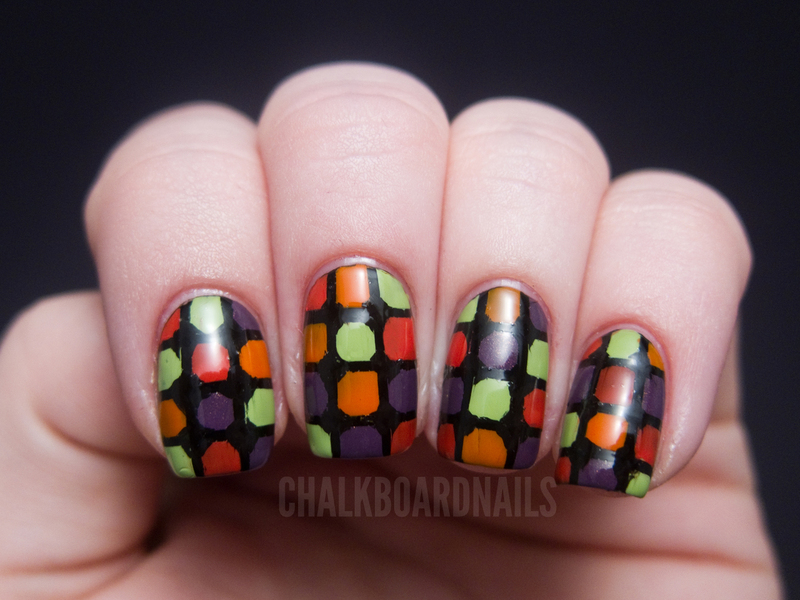 Today we're doing to be taking a look at a nail art design that I did using the LCN Colour Me Up box set. The set comes with four colors, neatly displayed in a cube. The cube is decorated with tiled squares of each of the colors. I really like the look of it, so I recreated it on my nails. Creating this look wasn't my easiest design ever, I'll say that! I started with a black base. I painted over that with a quick dry topcoat to set it faster, and once that was dry, I placed striping tape on the nail horizontally and vertically, creating squares. 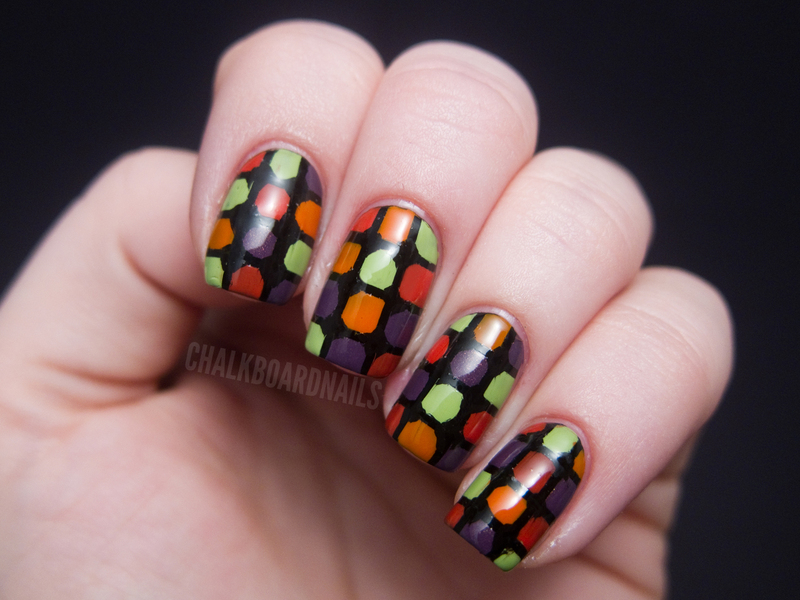 Then I just used the polish brushes to fill in the squares randomly with the four colors. Carefully remove the tape to reveal the design! TIP: Wipe most of the excess polish off of the brush first! When you are filling in such a small area, it's easy to flood it if you have too much polish on the brush. Then I just went over the corners of the squares with a small nail art brush and some black polish to round them (like on the box). As you can see, it was difficult to control in that small of an area, so my results are a bit inconsistent. It's barely noticeable at a distance though! Here is a shot of the cube display with the pattern on it. The colors in the set are pretty and have a very consistently nice formula. They are all very pigmented and provide good coverage in two easy coats. Spice Up Your Life - A pigmented orange creme. It looks lighter here in this nail art than it does if you are wearing it alone. Some Like It Hot - A vibrant coral red. This color is really beautiful. I'm not usually into red shades but this one is lovely. Fanappleistic - A light apple green. Creamy and opaque, its reminiscent of spring to me. Colour Me Up - The namesake shade of this collection! A royal purple with gold shimmer. This is the only non-creme in the collection. Despite the amount of time it took me to finish this manicure, I really truly love the results! I also enjoyed taking inspiration from the product packaging. That's something I've never done before. Integrated and graphically bold! What do you think? Would you spend the time to create such a unique and bold look like this? 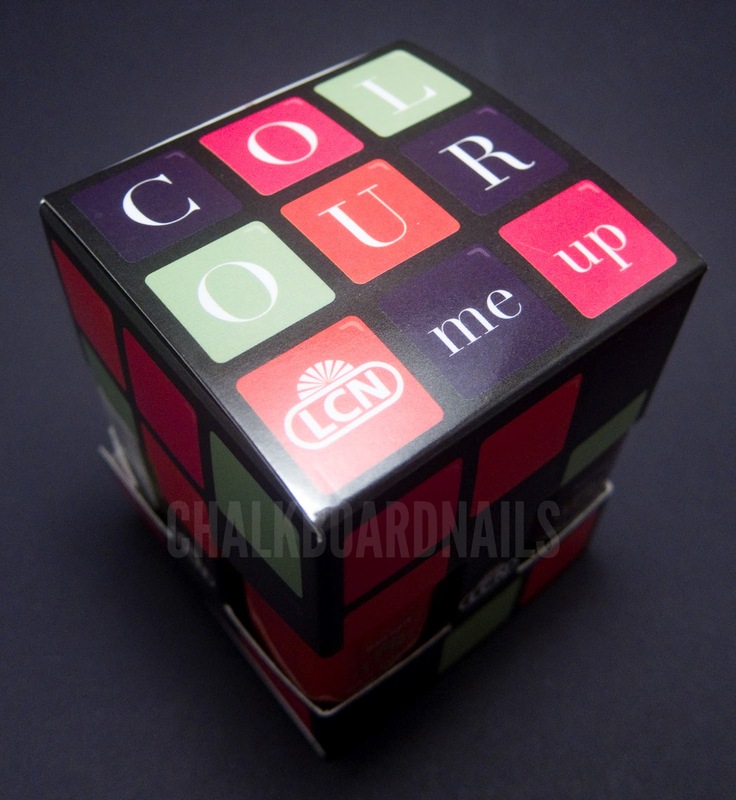 The LCN Colour Me Up box set can be purchased directly from LCN's website for $29.90, where the individual polishes are also available for $7.50. You may also be able to find these polishes at your local beauty supply. 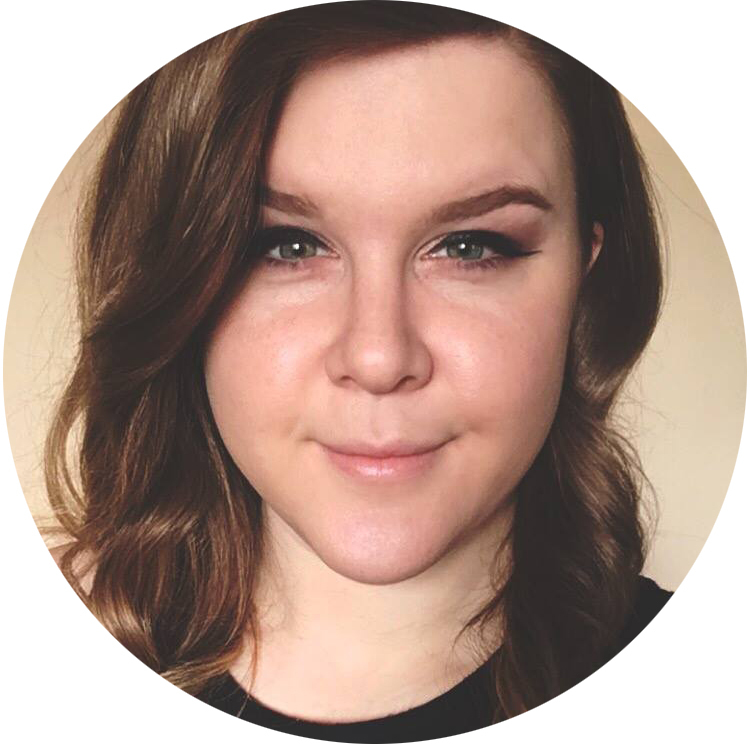 By the way, in case you missed my epic Black and White Glitter Comparison Post, I have added a link to it in my top nav bar. I hope to continue to add to it as my collection grows! Very pretty! Your patience (and skill) much exceeds mine. So fabulous! Very talented, you are! I love it, looks great! 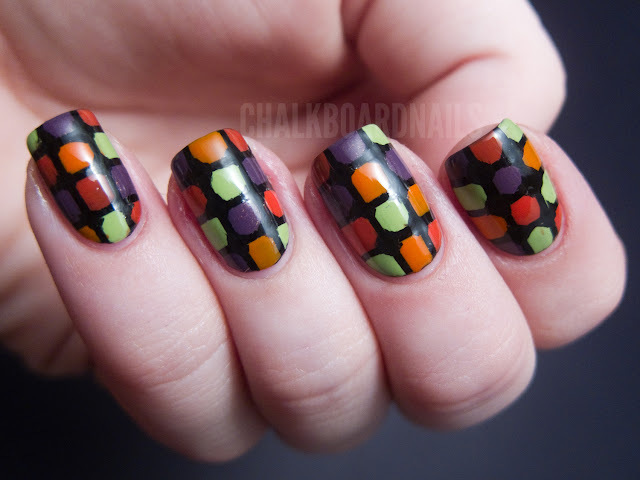 I can imagine this mani was'nt that easy. But oh my it looks great! Wow. seriously you're awesome <3 I love all your manis ! This one looks amazing. So cool. this came out ridiculously awesome. this is great!! your cuticles look great too!! What a great mani! I love seeing colour sets that actually look this good together, and your concept for them is adorable!